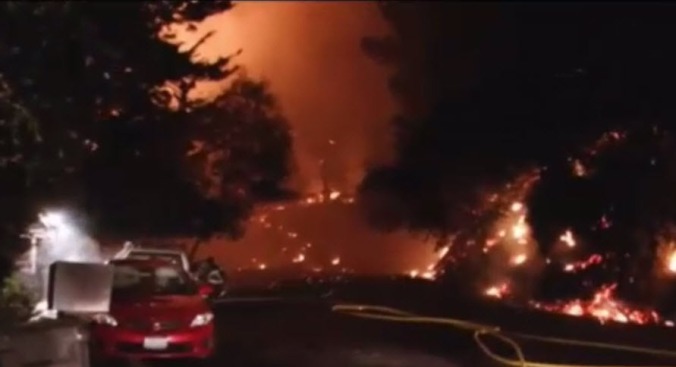 Five structures burned and 50 homes were evacuated late Monday after a blaze ignited in the Oakland Hills, according to fire officials. The blaze sparked around 11:30 p.m. at a two-story house that is under construction in the 6800 block of Snake Road in the Montclair neighborhood, officials said. Flames then spread to one more home on Snake Road and three others on Asilomar Circle. Seventy-one firefighters and 23 units responded to the blaze and appeared to have the main fire under control around 1 a.m.
Resident Norman Miller described the scene he woke up to at his Oakland hills house Monday night. The UC Berkeley hydro meteorologist immediately grabbed a garden hose. "I heard an explosive sound, and I saw flames roughly 10-20 feet," he said. "I saw flaming embers falling on my deck, on my roof. I got up on the roof and started hosing my roof." Residents were evacuated to Montclair Elementary School before being allowed to return to their homes, according to fire officials. Several accounts of the blaze were posted on social media, including one from Vassil Mladjov, who said an evacuation was in progress. He captured video of firefighters preparing to launch a drone. Another tweet from Nikhil said he was evacuated from the 1800 block of Gouldin Road. Yet another tweet from @tracey_pooh said the flames were about six blocks from her house, and she saw an orange glow up the hill from her home. Following October's North Bay fires and the current blazes burning in Southern California, Oakland Fire Department Chief Darin White said Golden State residents need to be on heightened alert. "I think as we can see what's taken place here in Oakland and what's happened in Southern California and other areas of the state and in this region, fire safety is truly important and is starting to become something that people need to be more concerned about on a year-round basis, not just seasonal," he said.